And, when Harvey realized that he'd hit his lowest point he still found a way to get through it. "I sat down and started crying, but a voice said, 'If you keep going, I'm going to take you places you've never been.' It was like God said, 'Don't quit, you're almost there.'" And he got there! His bestselling 2009 book Act Like a Lady, Think Like a Man has been adapted into a blockbuster film and a sequel. 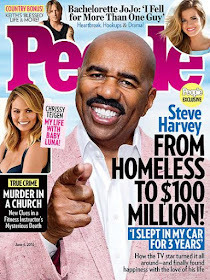 He now hosts a syndicated radio show as well as the game show Family Feud and a hit daytime talk show, The Steve Harvey Show and most recently he hosted NBC's hit variety series Little Big Shots. But when he first quit his job to take a chance at being a comedian, he found himself separated from his wife, on his own and living on as little as $50 a week. "That was an ugly period, just very painful," he says of becoming homeless in the late '80s. Everybody has a moment when they turn back, when you say to yourself, 'This is too much,' " Harvey says. "I had it on several occasions." Success shortly followed, with Harvey landing a high-profile gig performing on Showtime at the Apollo in 1993, and eventually, a sitcom, and a spot on Cedric the Entertainer and the late Bernie Mac's Original Kings of Comedy tour. Even now, though, with a happy marriage and family life, as well as his status as a television mainstay, Harvey says he can't slow down. "I'm running from homelessness," he shares. "I can't ever be in that position again. If my show gets canceled, I've got three more. I don't have any free time, but I have 12 jobs."